Borough President Gale Brewer’s hearing on the Inwood rezoning on April 10, 2018. On Tuesday night, residents packed the auditorium of IS. 218 for Manhattan Borough President Gale Brewer’s hearing on the de Blasio administration’s proposed Inwood rezoning, with most testifiers speaking passionately against the proposal. Watch a video of the hearing here. Brewer made her concerns about the rezoning clear upfront. (To invite people to the hearing, her office had been distributing a brochure including a labelled map of the rezoning, and with the header, “No rezoning in Inwood = gentrification, Bad rezoning in Inwood = gentrification.”) In her opening comments she stated that she had two main questions: whether the plan would make the housing crisis better or worse, and how would it affect small businesses. She noted the prevalence of preferential rents in the neighborhood, which could make rent-stabilized tenants more vulnerable to displacement, the potential for much of the new housing to be market-rate, the fact that the rezoning would reduce job-generating industrial space, and how 147 businesses along the “Commercial U”—the commercial strips on Dyckman, Waterman and West 207—are located on low-rise soft sites that are likely to be redeveloped in the event of a rezoning. Prior to the public testimony, she convened two pre-assembled panels, one on housing affordability and one on small businesses. It was an unusual structure—one that gave residents far more than their usual two minutes at the mic—and on each panel, three out of the four speakers spoke with passion against the rezoning (the remaining two were city representatives). “Despite all the talk about public investment in the Inwood plan, we have heard nothing about the condition for buildings in the Dyckman Houses development,” said Cheryl Pahaham, a member of the Uptown United coalition, referring to the need for investment in the neighborhood’s public housing complex. She also called for investments in community land trusts as a method of creating new affordable housing. Representatives for the Department of Housing Preservation and Development (HPD) and the Economic Development Corporation (EDC) emphasized the number of resources that would accompany the city’s plan to protect tenants from displacement, including the Tenant Protection Unit that conducts door-to-door outreach, planned investments in 100 percent affordable housing at the site of the current Inwood library and on a waterfront property owned by Maddd equities, and a new program providing legal assistance to small business owners. They said a rezoning would help transform the neighborhood’s vacant lots and parking lots into opportunities to meet the community’s needs and create waterfront access, but also that that they were taking all feedback seriously. “We understand the challenges that you are going through. It’s not falling on deaf ears…Action is needed to shape that change in a way that benefits Inwood residents,” said EDC’s Charlie Samboy. Councilmember Ydanis Rodriguez, who invited the rezoning study and will have the ultimate say on its approval, was greeted with loud boos. Later, asked by City Limits if he supported Congressman Adriano Espaillat’s proposal to make the city subsidize the creation of 5,000 lots in the neighborhood, Rodriguez said he’d estimated the city so far had plans to subsidize about 1600 affordable units but would continue pushing for a greater commitment of subsidy. He said he’d also push for the creation of at least 100,000 commercial square feet of space affordable to small businesses. The night was long (four hours) and, as usual with such events, slightly hectic. The Spanish translation equipment failed, just as it did at the community board vote, provoking the audience’s outrage. Brewer’s team then tried to translate each testimony delivered in Spanish. Other elected officials who don’t get a vote on the rezoning—Comptroller Scott Stringer, State Assemblywoman Carmen De La Rosa, Senator Marisol Alcantara—also declared their great concerns or opposition to the rezoning. 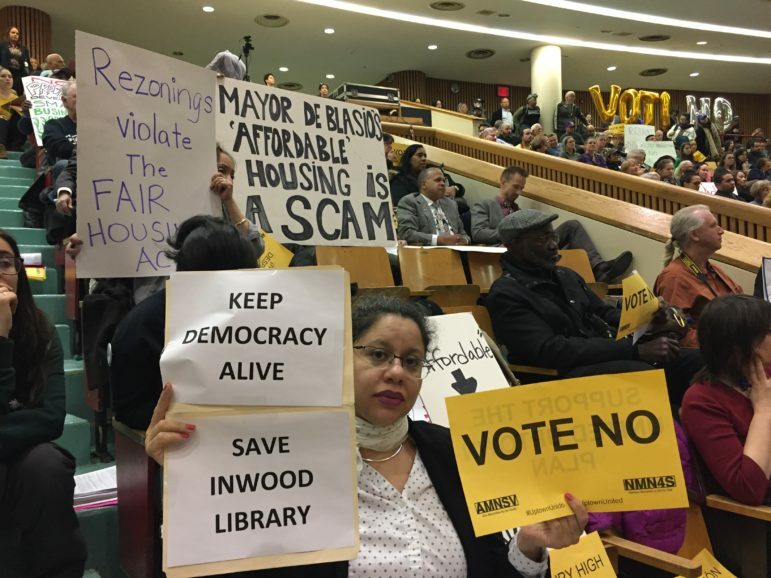 Many residents said they believed the Inwood rezoning would exacerbate the displacement of Black and Latino residents and small businesses, and others predicted overtaxed infrastructure and school overcrowding. Several speakers recommended that Brewer support the Uptown United Platform, an alternative community plan. And there were a few outliers: A local property owner who, over the crowd’s booing, stated that the rezoning would be an “incredibly efficient way to create permanently affordable housing” because market-rate housing could cross-subsidize the affordable units, and that “displacement happened in Park Slope and Astoria without a rezoning.” A woman spoke to the way the “rezoning is an opportunity” to create affordable housing that will keep Inwood’s expanding families together. Rodriguez and Brewer stayed until the end of the hearing. If Brewer’s work on the East Harlem rezoning last summer is any precedent, it’s likely that she’ll continue to position herself as a critic of the current proposal and push for the Council to make changes. In the case of the East Harlem rezoning, Brewer ultimately expressed support for the final plan, though there were many residents who remained opposed or skeptical. What remains unclear is just what kind of changes Brewer will push for in Inwood: Will she demand the city scrap its proposal to upzone the “Commercial U?” Will she reduce the amount of space that is rezoned for residential development east of 10th Avenue? And then there’s the bigger unknown: to what the Council and the administration will agree. The “local property owner” has property that stands to get rezoned (and revalued) from zero residential use to 11 stories of apartments; that may have colored his new-found passion for affordable housing. If most residents are opposed to the re-zoning then Rodriguez should veto the plan. Ditto for all the upcoming rezonings. Local residents and their elected officials know their own neighborhood best. Not any city agency and surely not our inept mayor Bill deBlasio. Doesn’t make me wrong, you can’t finance the construction and maintenance of affordable units without market rate units. I believe the total number of new units expected to be created by the suddenly urgent need to rezone sleepy and happy Inwood is in excess of 10,000. Let me ask this: where is the new classroom space for all the new resident’s school-aged children expected to move to Inwood? The city has so few opportunities to leverage the building of classroom space on Manhattan soil, they should not be creating such a bulk quantity of brand new air rights without leveraging the appropriate number of classrooms/schools. The deBlasio administration is not considering what all this new construction will do to the city’s aging infrastructure particularly NYC’s 100+ year old water/sewer systems. It will take a crisis like dangerous drops in water pressure for our idiot mayor to pay any attention to this issue. This is totally backwards from what we’ve seen in the last 15-20 years. 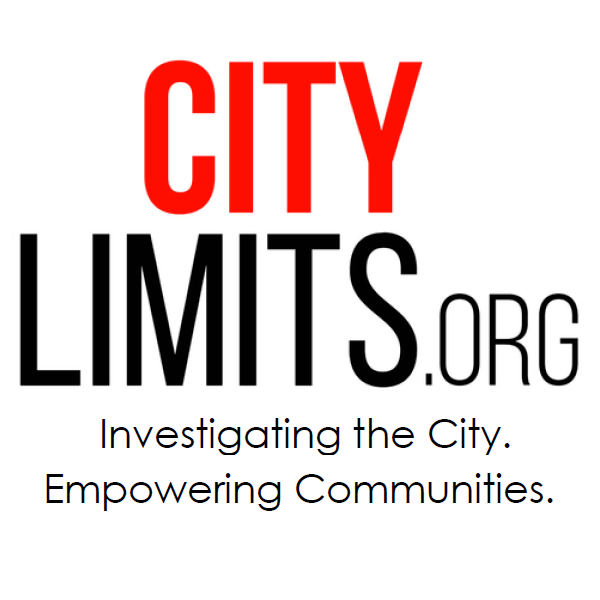 Displaced residents of rezoned areas relocate to other areas into driving up gentrification. I applaud the residents of Dyckman, They have demonstrated that despite all the flowery rhetoric coming from council member Rodriguez and his real estate fear to monger, the residents arent buying it and if they go down, they are sure taking everyone with them. East Flatbush joins the list of neighborhoods where residents say they’re facing an onslaught of out-of-character development. While the Long Island City rezoning study has been moving slowly, there have been controversial developments both west and east of the study area.